SRG’s unparalleled Worldwide Webinar that produced internationally licensed PTs and PTAs around the globe is now opening its 13th season! Join us and become one of the hundreds of#heartstrong individuals who have experienced the revolutionary new approach to passing the US NPTE/NPTAE/Canadian PCE/APCE! Packed with the MOST COMPREHENSIVE lectures from the MOST CREDIBLE and SEASONED LECTURERS in the review industry, and an UNBLEMISHED RECORD with any international licensing body! 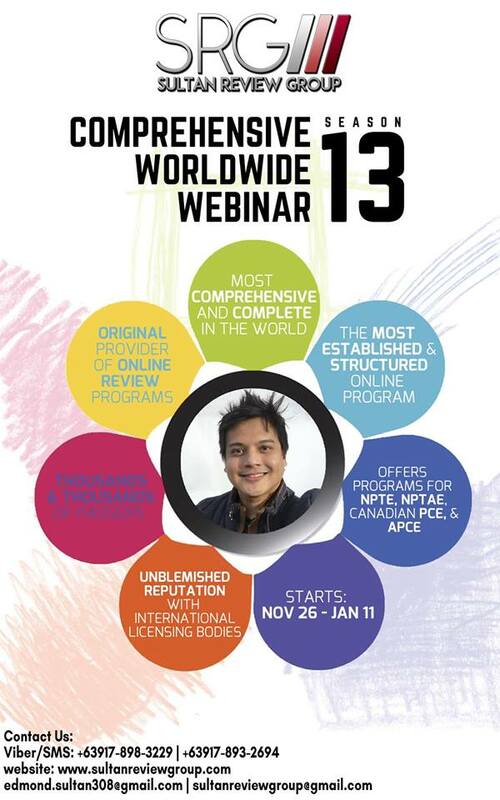 Previous Entry:GET A GLIMPSE OF HOW SRGDELIVERS HIGH-QUALITY LECTURES! Next Entry:GET THAT PTA LICENSE!